Nothing signals spring quite like singing birds. As the length of days increase, male birds begin to sing to protect their territories from neighboring males and advertise their presence to nearby females. In spring, those males are vibrantly colored and may be easy to see, because they often sing from high, exposed perches. A good field guide can help you learn to identify birds by sight. Spring also provides an equally good opportunity to learn to identify birds by song. Each species has a unique song or series of vocalizations, which distinguish it from the remaining 10,000 bird species on earth. While it may seem daunting, learning to bird by ear is a perpetually rewarding skill. A tuned ear will detect a higher number of species than can eyes alone. 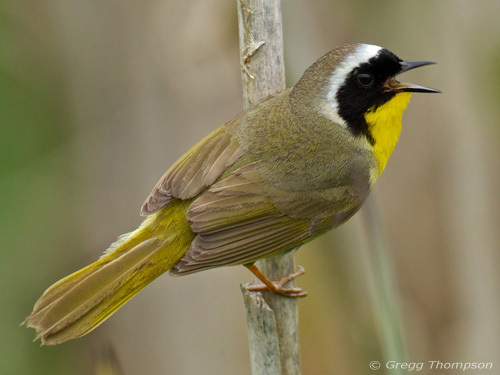 To help people tune in to the songs of birds, Dr. Dennis Paulson, BirdNote science advisor, recommends starting the way he did before there was a single record or tape or CD of bird songs available. He calls it the Identify and Listen method: Go out in the field and learn to identify the birds you see from whatever field guide you use. Start in winter and spend time looking at small land birds, as they are the main singers. Males of the resident species will be the first to start singing, quite early in spring. Soon migrants will arrive and add their voices to the chorus. Singing may go on in your area for three months or more, so there will be a lot of learning time. At lower latitudes, some birds sing even during the winter. 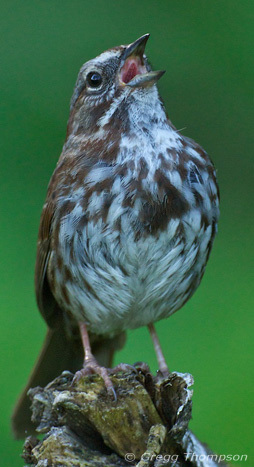 Dennis’s steps are straightforward and allow you to build your skill gradually, bird by bird: Step 1) If you already know what a Song Sparrow is, when you see one singing, you can connect the song to the bird. Listen carefully to its song until you feel you really understand what it sounds like and hear its variations. Step 2) Repeat Step 1 with another bird. But CDs are available now and can be downloaded to a portable MP3 player or similar electronic device. These are helpful resources, but may be overwhelming to beginning birdwatchers. As Dennis writes: You can listen to CDs of bird songs from your area over the winter and then practice once the birds start singing in spring. But I find this to be a more labor-intensive method and more likely to produce mistakes, as there are a lot of birds out there with similar songs. My approach is to learn the song from the bird, then listen to it again on your iPod to see if your recording sounds the same as what you heard. If song and recording are congruent, you have a good reminder any time you wish to listen to it. If you have CDs and a computer, consider making a playlist of the species common in your area. If you don’t know what those species are, ask an expert birdwatcher from your local Audubon chapter. Select five songbird species for your playlist on your computer or MP3 player, and you can listen to and study them at any time, at home or on the go. Once you are familiar with those, add another couple of common species to the playlist. The next time you hear the dawn chorus, you'll be able to parse out the songs you recognize and chase down the sounds you don't. If you can visually identify the bird in question, you've found the next addition to your growing playlist! Keep building your playlist and soon you will be comfortable with most of the bird species that breed in your area. No matter how you approach birding by ear, it is a skill that can always be improved. Learn the bird songs of birds in your back yard, then your local park, your county, across your state, and so on. Next thing you know, you'll be identifying birds with your eyes closed. Have tips to offer? Let other readers know in the comment field below! Websites can help you learn the songs of specific species. Cornell’s AllAboutBirds is one of the most comprehensive resources for the birds of North America, a reference guide of bird calls. The Macaulay Library of the Cornell Lab of Ornithology is the world's largest archive of wildlife sounds and videos. The Library also offers an impressive number of downloadable audio guides, including a master set of bird sounds for North America. Are you more of a visual learner? Spectograms may be your ticket to learning bird song. Bird Song Hero is a game from from Cornell that helps you learn to visualize different bird songs. It starts with a video tutorial on how to read a spectogram. If you'd like to download free bird songs and calls from around the world, please visit Xeno-canto. The collection features recordings of 9,000+ bird species (as of May 2014) recorded and uploaded by members (they also have spectograms). No matter the operating system on your smartphone – iPhone, Android, Windows Phone – you’ll probably have a bird-specific app available to you, including many from large and well-respected field guide publishers. Most of these apps include comprehensive libraries of bird sounds that users can refer to in the field. Learn more about National Geographic, Sibley, Audubon, Peterson, and iBird. See if there is a free version you can test before you make your final purchase, or ask your friends which app(s) they like. Originally published April 2, 2012. Updated May 14, 2014. More to learn about birding by ear!